This CellML model has been coded by translating the authors original XPPAUT.ode file, which can be found at http://www.math.fsu.edu/~bertram/software/islet/BJ_07/mitophan.ode. The model runs in PCEnv in COR and is able to produce the published results. The parameters have been chosen to recreate the bursting behaviour seen in figures 3 and 4 of the original paper. Some equations have inconsistent magnitudes due to the fact that some units are defined in milliseconds whereas others are defined in seconds. Glucose metabolism plays a key signalling role in insulin-secreting pancreatic beta cells. In addition to generating ATP - the ubiquitous form of energy used to fuel many cellular processes - glucose metabolism in pancreatic beta cells is also the means by which blood glucose levels are monitored, ensuring an appropriate level of insulin secretion. ATP-sensitive potassium channels in the plasma membrane are activated by ADP and are inactivated by ATP, therefore a high ATP/ADP ratio results in a reduced number of open, ATP-sensitive, potassium channels. In turn, this results in membrane depolarisation and voltage-sensitive calcium channels open. The resulting influx of calcium ions into the cell cytosol induces insulin secretion, which in a healthy individual typically occurs in oscillatory waves. These can be fast with an oscillatory period of less than a minute, or slow with a duration of 2 to 7 minutes, or they can be a combination of fast and slow waves. This oscillatory pattern of insulin secretion appears to have a physiological function which is of particular interest since it is lost in patients with type II diabetes. Although the definitive mechanisms underlying these insulin oscillations are unknown, in the paper described here, Richard Bertram et al. suggest that calcium feedback onto ATP production or consumption is responsible for the fast component of the insulin oscillations, while oscillations in the glycolytic pathway are responsible for the slow component. 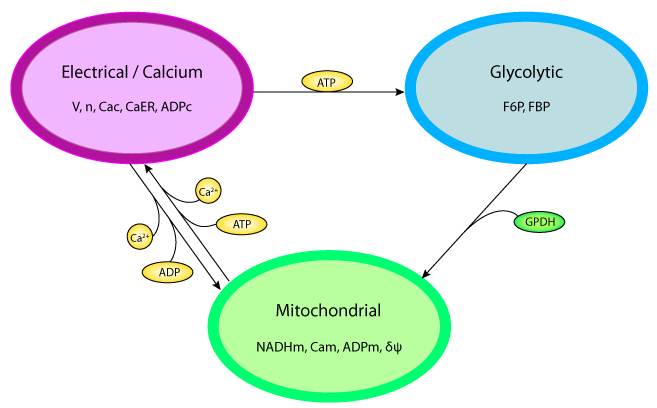 Furthermore, they build these phenomena into a mathematical model that combines a model of mitochondrial metabolism with models of glycolytic oscillations, plasma membrane electrical activity, and calcium handling in the cytosol and endoplasmic reticulum (summarised in the figure below). Schematic diagram of the model components and the variables which are exchanged between the components. The authors highlight that the original model code can be downloaded here. Derived from workspace Bertram, Satin, Pedersen, Luciani, Sherman, 2007 at changeset 1a78488e2cb0.